This portrait of a woman in the process of dressing up is positive and clearly defined as it also gives a psychological insight. Here, the artist has sought to combine illusionism with realism and the impact is there for us to witness. The woman has a seductive physical appeal. The attire shows her in a semi-dressed state, revealing her slender, youthful arms. A thick chain with a pendant clings passionately to her neck and a stone studded necklace follows. She wears large ear studs and her nose ring drops kissingly on her bow-shaped red lips. Light colored, almond shaped eyes and a thin regal nose add to her beauty. Long, black, freshly oiled hair cascades down her back. 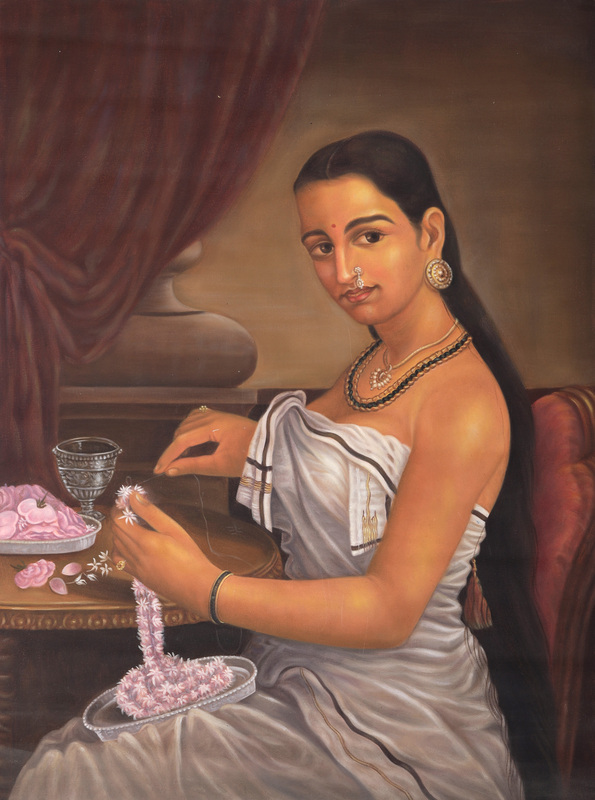 Self-engrossed in her thought and activity, she is stringing jasmine flowers to adorn her hair, keeping them ready on an earthen tray sitting on her lap. Roses lie in another tray waiting to be strung. A wine glass lies next to it symbolizing the intoxicating effect of the one standing aloft. The cushion and the curtains are rich red in color, gaining a texture quality through comprehensive shading. The rich silk drape is mainly a volume inducing chiaroscuro. Various hues and tints of red are used liberally all over. Depth, shadow, perspective is all a way of pictorially apprehending the real and the artist has done a wonderful work with their aid. He has been able to balance the naturalistic rendering of the face, anatomy, colors and the scene with full lyrical tenor (rasa) and expressive eloquence (bhav).